What is Tramadol? Can You Overdose? Tramadol belongs to a class of drugs called opioids, which are commonly prescribed to manage pain. While tramadol can be a useful medication when used correctly, it can be deadly when abused. Understanding the signs of an overdose and knowing what to do in case of an emergency can be crucial to saving lives. Opioids work by binding to special receptors in the brain and interfering with pain signals, and may also affect parts of the brain responsible for regulating reward responses and breathing. Taking too much can cause serious, even life-threatening, side effects. Unlike some of the other more typical opioids, tramadol's effect on the archetypal opioid receptor (mu receptor) is weak. A marked seizure potential exists for tramadol when taken in doses that exceed prescribed parameters. Because opioids are linked to the brain's regulation of breathing, respiratory depression--that is, when a person's breathing becomes inadequate to support them--is one of the most serious concerns in an overdose and can lead to death. 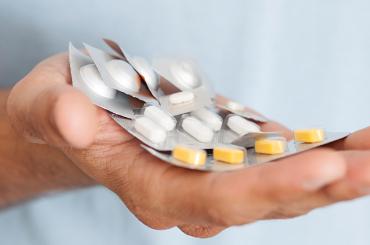 In 2013, about 3.2 million people used tramadol for nonmedical purposes. NSDUH Drug dependence is a major risk factor for an overdose. While in general tramadol has been shown to have a lower potential for abuse and dependence than more potent opioids, such as codeine or hydrocodone, its abuse rate has been growing. According to the National Survey on Drug Use and Health (NSDUH), about 3.2 million people used tramadol for nonmedical purposes in 2013, up from 2.7 million in 2012. Drug dependence is often associated with tolerance, which means the user requires higher and higher doses of the medication in order to achieve the same effects. This kind of behavior can be associated with an increased risk of overdose. If you're concerned that you or someone close to you may be suffering from dependence on tramadol, please call 1-888-993-3112Who Answers? to speak with someone about treatment options. Some demographic factors may also have a bearing on the likelihood of a tramadol overdose. According to the NSDUH survey, the majority of people who abused tramadol were over the age of 26. Already suffer from a narcotic addiction. Also, according to the Centers for Disease Control and Prevention, men are more likely to overdose on prescription painkillers, in general, although overdose rates in women have been rapidly rising in recent years. Prescription painkiller dependence is in general associated with dependence on other substances, such as alcohol. People who have struggled with substance addiction in the past may be more susceptible to dependence on opioids, putting them at higher risk of an overdose. A tramadol overdose can be fatal, so it's important to contact medical professionals immediately if you notice any signs of toxicity. In the case of milder symptoms, you can contact your local Poison Control center at 1-800-222-1222 for advice on how to handle the situation. Is experiencing respiratory or cardiovascular difficulties. Loses consciousness at any point. These can be signs of a serious, potentially fatal, overdose and should not be taken lightly. Overdose is most likely when the drug is being abused, so the best way to avoid a tramadol overdose is to use the drug correctly. Take tramadol only if prescribed by a doctor. Follow your doctor's dosage instructions. Take tramadol as it's prescribed; usually orally. Snorting or injecting crushed up tramadol can be dangerous, especially at high doses. Central nervous system (CNS) depressants (e.g., Valium, Xanax, Ambien). Tramadol dependency can increase the likelihood of an overdose--it's important not to wait if you think you or a loved one may be suffering from tramadol addiction. To speak to a treatment support team member, please call our toll-free line at 1-888-993-3112Who Answers?. According to the federal Food and Drug Administration (FDA), treatment of a tramadol overdose should focus first on maintaining adequate ventilation, so the patient is able to breathe. Naloxone is a type of narcotic that may be used to help reverse the effects of a tramadol overdose. It works by attaching itself to the same receptors in the brain that tramadol (and other opioids) affect, preventing them from binding at these sites and producing their usual effects. Because of tramadol's somewhat atypical mechanism of action, naloxone administration only partially reverses some of the dangers in an overdose situation. Furthermore, while naloxone can help to somewhat reduce the respiratory and central nervous system depression that an overdose might cause, the FDA warns that it can also increase the patient's risk of seizure and should, therefore, be used carefully. A type of narcotic may be used to help reverse the effects of a tramadol overdose, but should be used carefully.Should seizure activity be present, appropriate sedative or anticonvulsant medication is indicated to safely manage the patient. Patients experiencing severe respiratory difficulties may need to receive oxygen. In severe cases, patients may also experience irregular heartbeat or cardiac arrest or may need more drastic treatments, such as defibrillation. In these situations, extended hospital stays followed by continued treatment may be necessary even after the immediate effects of the overdose have been taken care of. If the patient was also suffering from a tramadol dependency at the time of the overdose, he or she might also have to cope with withdrawal effects during recovery. Since patients undergoing withdrawal may experience mood changes, such as nervousness. Some may also wish to seek treatment for their psychological symptoms during their recovery.